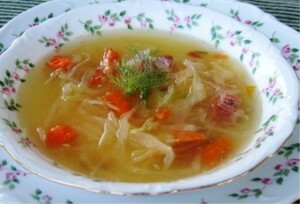 Sauerkraut soup, also known as “Kapusnyak”- in Ukrainian, or “Kapusniak” – in Polish, is a very refreshing, zestful, and nutritious soup. I like making Kapusnyak for Easter late afternoon meal, since in Ukrainian Easter tradition, very special foods are served for brunch, so Kapusnyak is a wonderful addition to this menu for an early afternoon meal. It also gives me a chance to use the leftover shank bone from the baked ham, and some of the pan juices, which add wonderful flavor to the Kapusnyak. Fill a 6 quarts (or larger) soup pot with cold water. Add the shank bone, and bay leaves, and some of the pan juices (these may be quite salty), and bring to boil. Add whole onion, chopped carrots, celery, and 2 dry Porcine mushrooms. Remove the celery stalks, whole onion, and the bay leaves. Drain the sauerkraut, place on a colander, and rinse under a running, cold water, for about 2 minutes, continuously mixing it, to remove most of the sour juices. Squeeze out, to drain the water, add to the soup pot. Bring to boil, and cook for additional 30 minutes, or until kraut is tender. Remove the whole mushrooms, chopped them up, and add back to soup. Remove the shank bone, cut away the remaining meat, and add the meat back to soup. Heat Canola oil in a sauce pan, add the chopped onions, and saute until golden. Mix in 2 Tbs of flour to the onions, and brown lightly. Gradually add some soup stock to this mixture, and mix well to creamy consistency (not lumpy), while cooking it for a couple of minutes, so it thickens. Add to soup, and bring to boil. Serve with a dollop of sour cream, and fresh rye bread. The Sauerkraut soup was delicious! Thank you for sharing your recipe! With this cold weather, I just made a pot of it for my family as well.